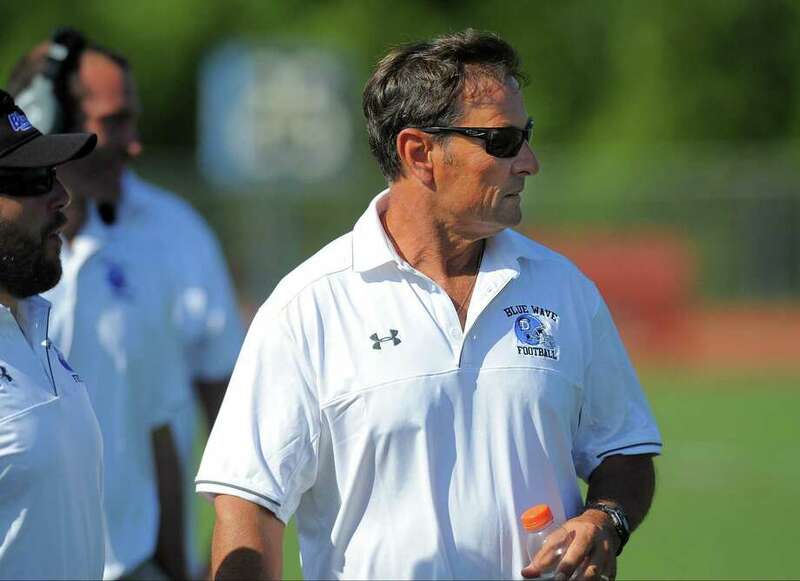 Darien coach Rob Trifone follows the action in the second half against Stamford in a FCIAC conference matchup. DARIEN — Darien Public Schools denied a Freedom of Information Act request to provide a copy of the surveillance tape that shows the incident at the Oct. 1 football game that led to the four week suspension of head football Coach Rob Trifone. According to a letter from Thomas B. Mooney of Shipman and Goodwin, the video is classified as an education record because it contains information directly related to a student which means it can not be released under the Family Educational Rights and Privacy Act. On Oct. 18, the superintendent’s office released a statement that Trifone would be suspended for an additional two weeks following his initial two week suspension after he was seen slapping a player on the side of the helmet during a game against Norwich Free Academy on Oct. 1. According to the statement, Trifone’s suspension was extended after the school accessed certain surveillance footage. The release did not specify what the footage showed or why Trifone’s suspension was extended. However, Mooney’s letter indicates the video is from the Oct. 1 incident. It is unclear what on the tape caused the suspension to be extended. Darien school officials would not comment on Trifone’s future with the team or his suspension. “All I can say is I’m standing behind what’s in the press release,” Brenner said when asked about the incident at a Board of Education meeting Oct. 18. In the incident causing the original suspension, Trifone slapped a Darien lineman on the side of the helmet after the player got into a verbal altercation with a Norwich player and had to be removed from the field. When the player approached Trifone, he yelled at the player before slapping him open-handed on the side of the helmet. Following the game, Trifone was told not to participate in team activity while the investigation was conducted. That resulted in a two-week suspension. In the statement issued by the superintendent’s office, Trifone apologized for his actions. Trifone’s suspension will now be through Oct. 30 at which time he will be reinstated to his coaching position.